For her latest solo harp recording Kim has selected pieces mainly from the rich repertoire of Irish and Scottish airs and songs. The Music of Jupiter from his inspired work The Planets. Additional selections include two compositions by Robert Burns, Ae Fond Kiss and Jamie, Come Try Me, and Robert Tannahill’s Are You Sleeping, Maggie? As on her previous recordings Kim combines superb artistry with a passionate sense of tradition, bringing a contemporary touch to a centuries-old instrument. 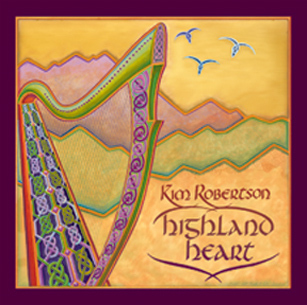 To view Kim's many books and arrangements (including Highland Heart) click here.